The Xcerts are to follow-up the release of their epic single 'Crisis in the Slow Lane' with an in-store tour to coincide with the launch of their album 'In The Cold Wind We Smile', set for 30th March. The band will see through 5 free shows starting in their hometown of Aberdeen, before continuing to Glasgow, Cheltenham, London and Kingston before embarking on more dates. Last year, The Xcerts toured with Get Cape Wear Cape Fly, Bat For Lashes and Feeder to name a few, and will continue to move through an epic tour schedule that includes an intimate boat show on Loch Ness and the odd festival! 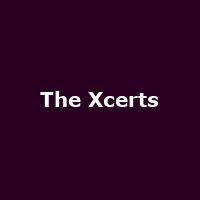 Creating accessible and punchy music, The Xcerts are working their way up the musical ladder, climbing the rungs towards becoming a headline act at larger venues. The energetic Scottish 3-piece are receiving continued support from radio DJs including Steve Lamacq and a multitude of press, and are certainly one to watch in 2009 (just as Allgigs predicted last year!) as they continue to make moves.